While trying to de-clutter my office I can across some software that wasn’t in use anymore. I decided to gather it together and liquidate on eBay. All was fine except for two discs that had seen some action and were scratched. I copied the contents to a hard drive to make sure they could be read but didn’t want to go through the hassle of installing them just to be sure. While perusing completed sales to find good starting prices I came across mention of a program called CDCheck. It will verify contents of a disc by reading it or comparing it to another. You can create a hash file from a good copy and compare it to others. As well you can attempt to recover files from a damaged disc. Plus it works with all removable media: anything Windows can read. It’s not a pretty program but it gets the job done. I scanned my two discs and they were free from errors. 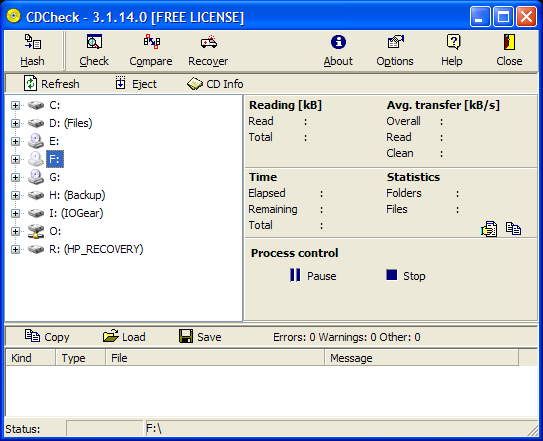 CDCheck is free for personal use but you need to sign up for a free license on the site.